A day as a volunteer at Auwahi actually starts the night before! Lunch has to be packed, water bottles filled, and backpacks, gear, and boots cleaned to keep any hitch-hiking seeds from being transported into the restoration sites. Make sure the alarm is set so you can be up at ʻUlupalakua Ranch by 8:00 am! Wake up early enough to get your tea or coffee made and have a light breakfast so you’re powered up for a day of hiking and working outside planting trees, removing invasive weeds, and collecting seeds. The drive out to ʻUlupalakua is beautiful early in the morning! Once you’re at the Ranch, park and come sign the mandatory waivers and sign-in sheets, and give your boots another good scrubbing with the brushes our crew provides. Hugs and greetings are shared with the staff and the wonderful group of people that come out to help the forest. Then we hop in the trucks for a 45-minute mostly 4×4 drive to the Auwahi forest, past Kanaio Natural Area Reserve. Along the way, we may pass many of the invasive species that have lead to the degradation of this area: goats, pigs, deer, cows, and many weedy plant species that compromise habitat where native plants once were. As we climb in elevation, more native trees can be seen, but there are no keiki plants beneath because of the animals just mentioned. Once we’re at the restoration site, you can see the 7-ft high fence that’s required to keep these ungulates out of the restoration area. 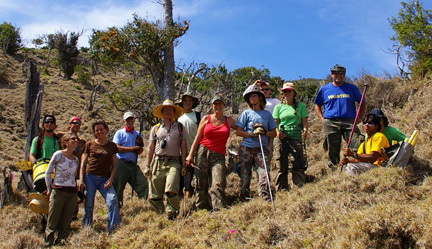 We unload the tools, gloves, trays of native seedlings, and ʻoʻos (digging sticks). Then the staff gives an introduction to the natural history of the area, a safety briefing, an oli (chant) to request permission to enter in a culturally appropriate way, and the mission for the day. We walk in together, listen to a planting demonstration by the crew, and work together as an ʻohana (family) throughout the day. First we plant ʻaʻaliʻi (Dodonaea viscosa), a quick-growing shrub species that locks out light and therefore many shade-intolerant weeds. It also drops leaves that create a nutrient-rich mulch for the native species we plant and for seeds falling naturally from adult trees. Mid-morning, the staff walks around with home-made cookies to give everyone a little appreciation and a boost to get you through to lunch. The planting continues, and once the energy starts to wind down we all sit together somewhere shady to eat lunch and talk story. After lunch, sometimes there is an impromptu ethnobotany lesson from one of the crew. Then either planting is resumed but with tree species, some very rare, amongst the ʻaʻaliʻi. Sometimes we walk through previously planted areas and pull weeds or collect native seeds, depending on what’s happening in the exclosure at that time. When all the work is done, we walk out together, lock the gate, and the crew has a cooler of cold soft drinks and teas for everyone to enjoy. We drive down again, and say our alohas at the Ranch parking lot, having come full circle. Although everyone is usually tired and dirty, there are lots of laughs and smiling faces, knowing that we made a significant positive change in the landscape. What a feeling! Visit www.auwahi.org to join in, or go to www.lhwrp.org to learn even more.